Stripe Payment Gateway for VirtueMart: This magnificent extension allows a user of the site to pay via stripe payment. This works with checkout for payment in Joomla VirtueMart store. It is a service that authorizes payment for VirtueMart. Admin has complete control of the system. Email notification on the transaction. Support for almost all kind of cards including Visa, Mastercard, American Express, Discover, JCB, Diners club etc. Integration of stripe API with TLS 1.2. Well compatible with PHP 7.1. Auto card type detection when the user enters the card number on the cart. Card Number is shown in a quad for four when entered. Stripe 3D Secure payments feature is added. Admin has the option to Allow/Disallow the Non-secure Cards from payments. Google pay, Apple pay, and Microsoft pay payment methods are added with inline payment. Google Pay: Google Pay stylized G Pay (formerly Pay with Google and Android Pay) is a digital wallet platform and online payment system developed by Google to power in-app and tap-to-pay purchases on mobile devices, enabling users to make payments with Android phones, tablets or watches. Apple Pay: Apple Pay is a mobile and digital service by Apple that allows users to make payments in person, in iOs apps, and on the web. It is supported on the iPhone and Mac. Microsoft Pay: Microsoft Pay (previously Microsoft Wallet) is a mobile payment and digital wallet service by Microsoft that lets users make payments and store loyalty cards on certain devices. Making payments is currently supported on the Microsoft Edge browser. Note: Google Pay, Apple Pay, and Microsoft Pay will work only on the live site. When you’ll download the Joomla VirtueMart Stripe Payment Gateway you’ll get one zip file (stripepayment.zip) unzip and use it. After unzip you will get the ( Stripe_Payment_Gateway_for_VirtueMart.pdf ) file then read it carefully and follow it. Please Note: This VirtueMart addon may not be compatible with any 3rd party One-page check-out, kindly generate a ticket for custom requirements that are considered under customization. 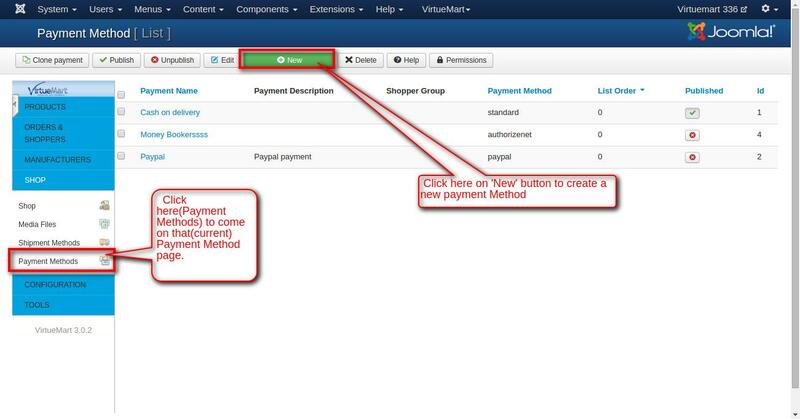 Step4: For Create Stripe Payment Method for VirtueMart and set all the required information for creating a payment method and save it than Select “Stripe Payment Gateway for VirtueMart” from Payment Method click save button to save the payment. Enter the credentials based on the mode selected. Set the description and logo for popup form. Set the order status for different payment response. At Front end, a buyer can able to do payment through stripe inline via “Apple pay”, “Google pay” and “Microsoft pay”, stripe JS and through stripe inline by simply entering credit card credentials. 1. View of GooglePay checkout: A buyer can do payment through “Google pay” checkout as given below in screenshot. Here a buyer is required to first add the card details to the chrome and can able to pay via “Google pay”. To add card details go to settings of browser and add payment there. 2. A View of Apple Pay: A Buyer can complete the payment via Apple Pay by using Stripe Inline Payment Method where card details needs to be added on buyer Wallet. After adding card details to buyer wallet, payment can be done by entering the “Passcode”. 3. View of stripe JS: To do payment via stripe a buyer can do payment by simply entering card details. A View of orders from backend: An admin can view the detail of orders from his backend along with the shipping and payment method details as given below in the order detail page. hello, i need to use with joomla 2.5 ? possible ? Hi, I have a problem. When tried to save parameters, it shows me that it is saved, but no parameters are saved and fields are empty.